Indeed, although I am very interested in your 4ghz P4. 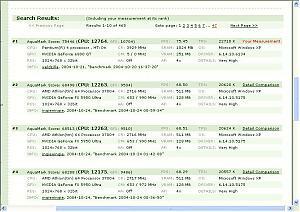 My 3.2ghz P4 has been a dissapointment... then again, my assumption is that performance improvement is linear to ghz. Also, I've heard that the prescotts with the bigger cache benefits more from higher clock speed than a NW. Can you confirm that? If you smell fanboy, then look real close to home. This is an unacceptable post! Steve gave clear and compelling evidence for his "Personal" point of view. He offered his views as being his and his alone. You have only offered your "Brand Loyalty" and childish criticism of those who don't share it. I was kidding, I am sorry if I made anyone "mad"
You are truely looking waaayyyy tooo deep for the reason I said it, the reason is straight forward. Steve has never pointed out any Intel equivilant being better than an AMD. Argue points, skip the name calling. Steve has most of the Forum that owns AMDs on his side. Relax, it was a silly joke. My point is in wording. Steve is extremely knowledgable, and quite intellegent, but he tends to start singing the AMD bang for buck song, which AMDs are not like that anymore. 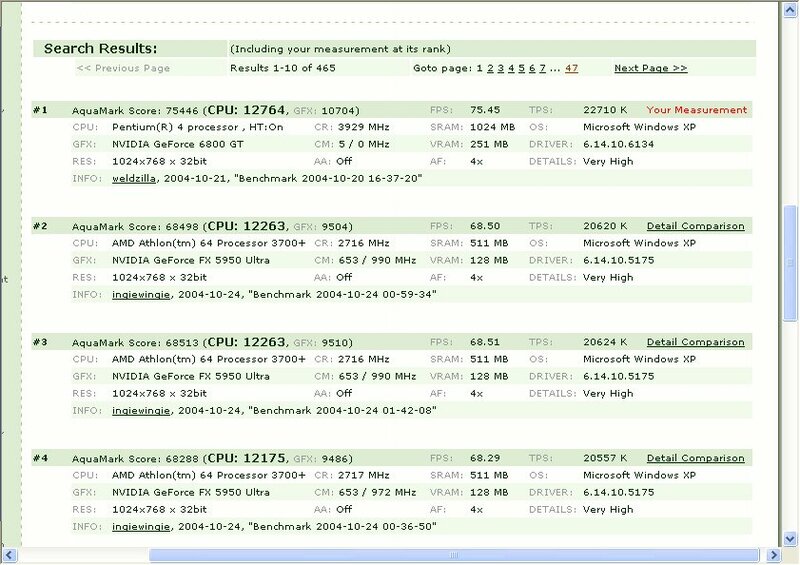 He said his Barton outperformed the P4 3.2GHz, I would like to see where he can prove this, and show us which parts are in each PC, he says he has been dissapointed, why is he? not stated, just the same thing over and over, he comes and tells someone who is looking to try something new a story that he has not proven yet, it is pure opinion. 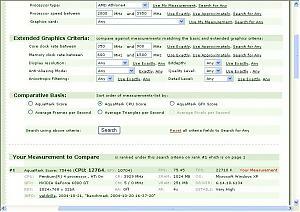 Next, I am not in any way a Intel fanboy, I own a XP2400, 1.4GHz t-bred, and a 1700XP, then I have a P4 2.4GHz@2.7GHz and a P4 3.06GHz@3.45GHz, from my experience, I have been much happier with the quickness and higher performing benches of the P4s, that is why the AMD are condemned to mundane tasks, such as a music server, etc. enough to make his $280 processor better than my $180 processor. Knowing in a benching tool, the 3500 would kill my little old "B" model P4, I am not going to try that, but I can tell you he still wanted my computer. Last edited by alexkerhead; 28th October, 2004 at 02:56 AM. Also, I've heard that the prescotts with the bigger cache benefits more from higher clock speed than a NW. Can you confirm that? Definatly, I don't know if it is the cache, but I think it has more to do with the 90nm architecture. Despite the bashing people give them, they are great CPU's, but dam toasty. But at 1.3V, there's plenty of headroom for OC, providing your PC doesn't melt too. Your opinion is yours, my opinion is still mine. However, the difference in our statements is that I never resorted to humor or a low brow attempt to debase the arguement. Daniel~'s comment is only to avoid a downward spiral of insults to win an arguement.... One which does not seem baseless. I suggest we both let the matter drop. Yes, this forum has a high percentage of AMD users. But there has been no 'loyalty' that I've seen. Everyone here just seems to care about 2 things, performance and/or cost. I'm tempted to unload my P4. In all seriousness, being tooo serious is not always a good thing. But it is when it's important. Funny as I just had a little convo with my ex on the web not too long ago. She is in some state visiting some guy. They were on messenger and on cam. He started to get a little pissed cuz she was "chatting" with me and being a little to much. So.... with that, be serious when you need to be, and play when others play along with you. you know I would think that a person who has used an AMD product for however long and has liked and enjoyed said product would tend to stand up for it. as would an Intel user. where people go wrong is when they think people should use and love what they use and love. cuz if it wasn't great then i would not be using it. I don't care for the bang for the buck theory. I buy what I want to try based on just that. I want to try it. If it makes you happy, be happy with it. but remember it might not be someone elses cup of tea. I am happy with what I have and I hope every user is happy with what they have!!. I can see & think the main thrust of your point is well founded. So long as you can see that some users are most contented with being 'scientific' about their choices, & that in matters of fact, science & evidence must always supersede opinion. In all seriousness, being too serious is never a good thing, unless by chance it happens to not be a bad thing too. Any surplus of state or emotion is likely to cause problems. By definition it is excessive & in this world moderation is often wise. However I don't think the case was one of too much seriousness being displayed. I think it was more the case that a point was made in earnest & your reply was more likely to be interpreted as flippant. Note I did not say it was neither I am requesting for it to be judged in any way thus. However I am saying that since we cannot see your intent to avoid misunderstandings (so much more likely when communicating only via text - we cannot see the quirky wry grin on your face...) you must chose the context & the words with extra care than when interacting face to face. I am certain you know all this. I am not claiming to be blameless I am sure you can dig up a post where I could be reminded of the same. Personally I feel it is a shame that it came up at all. Having said that I would not be one for having any jocular comments frowned upon altogether. Sincerely can you say alex that you would have found such a comment amusing if you were giving your earnest opinion on a subject you felt strongly / had experience of ? Searched near & far across networked lands for a sig. that would do. I explored far & wide, blocked by lulling tide, all I found was you. Last edited by DimViesel; 28th October, 2004 at 09:44 AM. Let's refer to the "What's your favorite processor" thread! People argue that intel skimps on design for ghz ratings, but if a 3.2ghz cpu costs the same as a 2ghz cpu, performs the same and puts out the same heat and uses the same power then does it matter what method is used to do this? I'm seeing alot of members jumping over to Intel. What's changed everyones mind? bugylessness is probably the biggest reason why i jump shipped..... to intel, eh eh. performance is damn good too. Intel seems to make very good quality products. Last edited by whatever; 28th October, 2004 at 07:07 PM. Pour gas on this fire!! I think you should switch!!! If we are talking bang for the buck here!! 3700 delivered to your door for $482 Now when it comes to cpu power. Let me show you a little factology. This in the form of pictures. I like looking at the pictures. As you will see, $ 287.99 gives you plenty of bang for the buck. As I stated earlier , if you are happy with what you have ,then be happy. I'm happy!! We are not including the GFX scores, only the CPU Scores, and there may be only 500 point difference, but there is a hell of a difference in price.